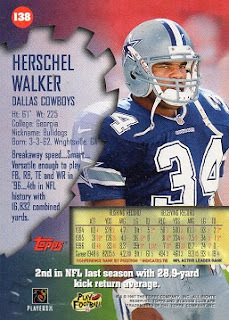 As I've noted previously, I'm always glad to add a card to the Hoard from Herschel's active playing days, that I don't already have. 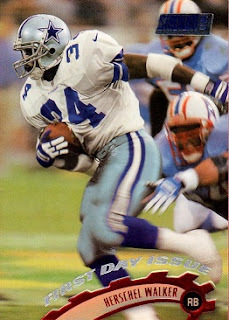 In this case, it's a 1997 Stadium Club First Day Issue #138. The picture is the same on each variation, but there are slight differences from the base card. You can see the words "First Day Issue", just above Walker's name on the front of this example. It really makes my day when a card like this pops up for sale. The fact that you don't see them all that often; and that this one was reasonably priced, was a real find. Another parallel I'm seeking from this set is the Herschel card from the "One of a Kind" series.